PAZA can be divided into 2 distinct phases reckoning back to its birth as a Peace Corps development project in 2007. The project objectives were the same that the weavers of Huancarani had stated as their needs at their first meeting with Dorinda that year. Phase #1 ran from 2007 through 2009 and was a time of collaboration and partnerships forming then falling apart. 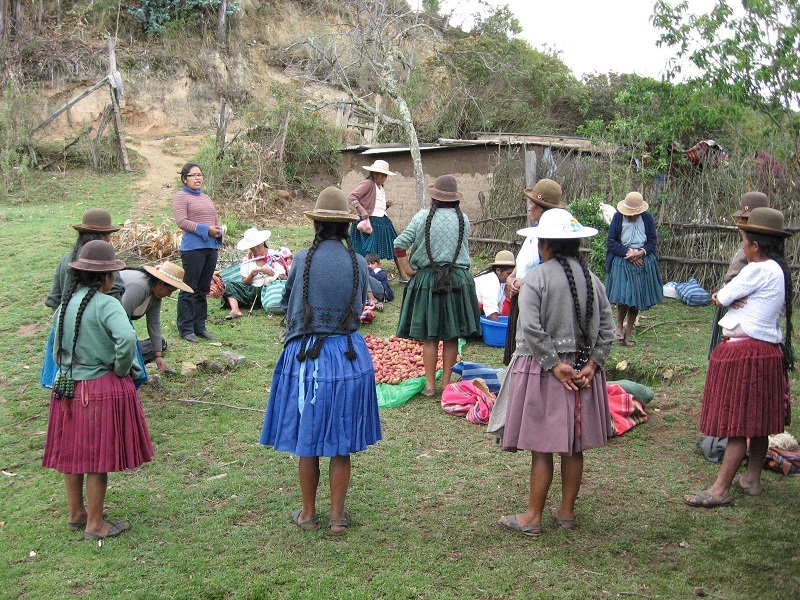 The Peace Corps left Bolivia in 2008. 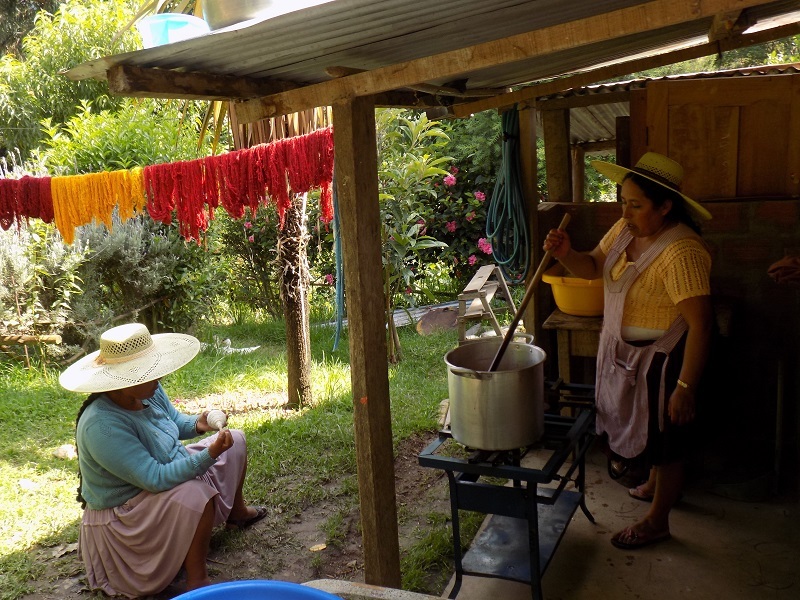 Dorinda carried on the work on her own partnering with Doña Máxima and they created a series of 5 natural dye workshops in 5 rural communities, barely keeping a step ahead of their students. The local government provided the transportation. 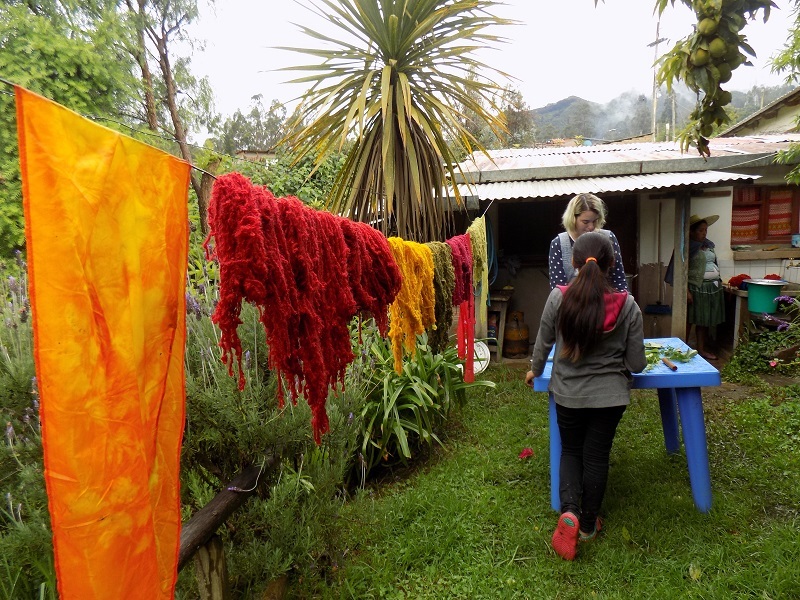 A Bolivian non-profit organization began working in Independencia in 2008 and supported the 2 three day intensive dye workshops that grounded those interested in knowledge of local dye plants and the mordanting process. Phase #2 began in 2010 when all local partnerships ceased due to petty local politics in Independencia. 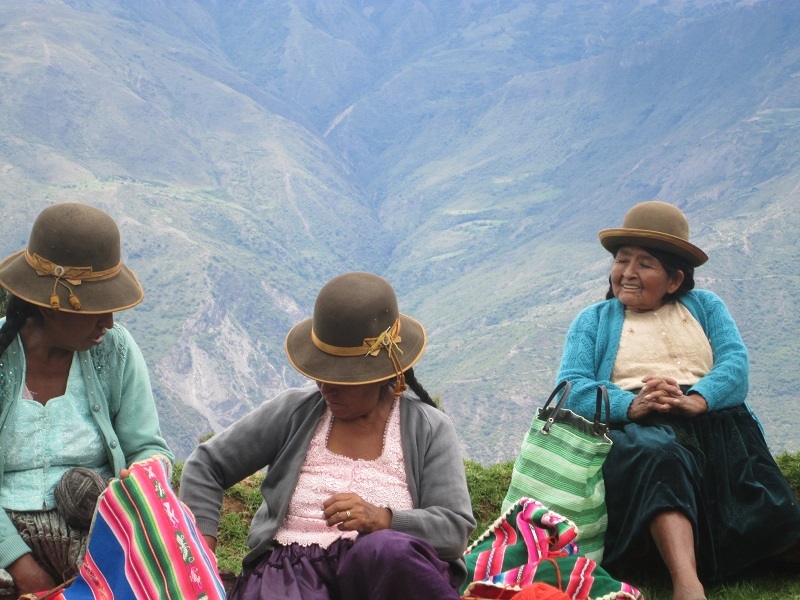 There were a few sleepless nights for Doña Maxima, the weavers of Huancarani, and Dorinda on how to move forward. The Club de Chicas (now Club de Artesanas) rose like a phoenix out of the ashes. Dorinda´s attendance at a Weave a Real Peace (WARP) Conference that year opened the door to a network of support that has flourished into friendships through the years. 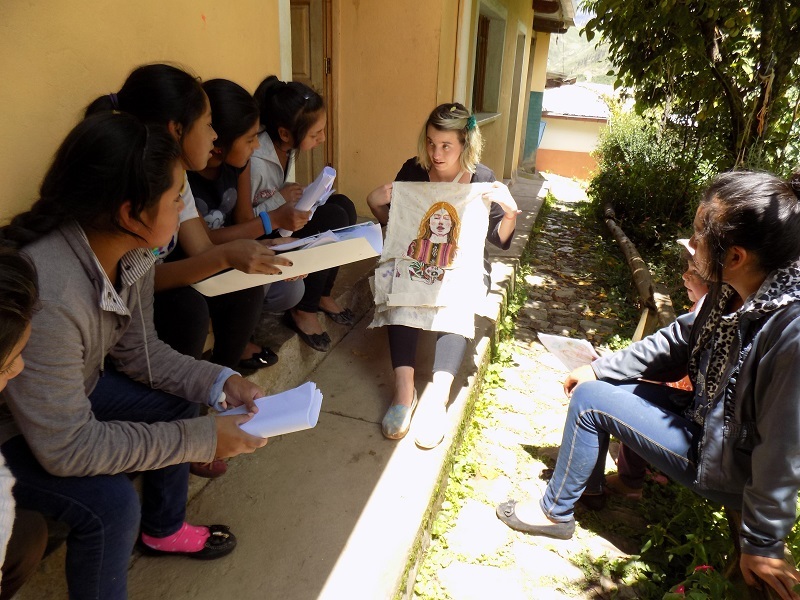 pursued from the U.S. Long time PAZA collaborator, Breny Ugarte, is a native of Independencia but a Quechua speaking professional with experience working with development projects for women. She is ready, willing, and able to help Doña Maxima and the core Club members leap into the entrepreneurial phase. 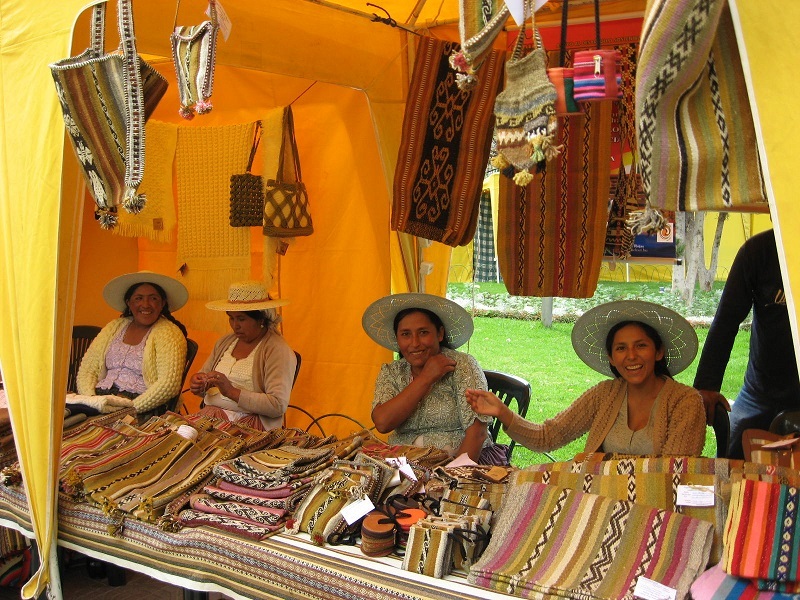 The traditional weavings don´t sell in Independencia, so having a line of fiber arts products that will sell locally can help more women earn an income. PAZA is leaving the Independencia based activities in good hands. 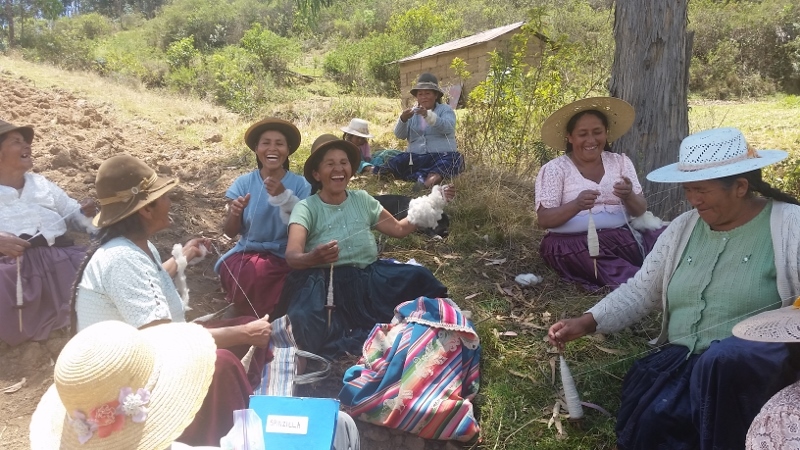 Please pass the word that the Bolivian team the Warmis Phuskadoras (Women Spinners) is in need of a TNNA sponsor for the 2018 Spinzilla Spinning Week. 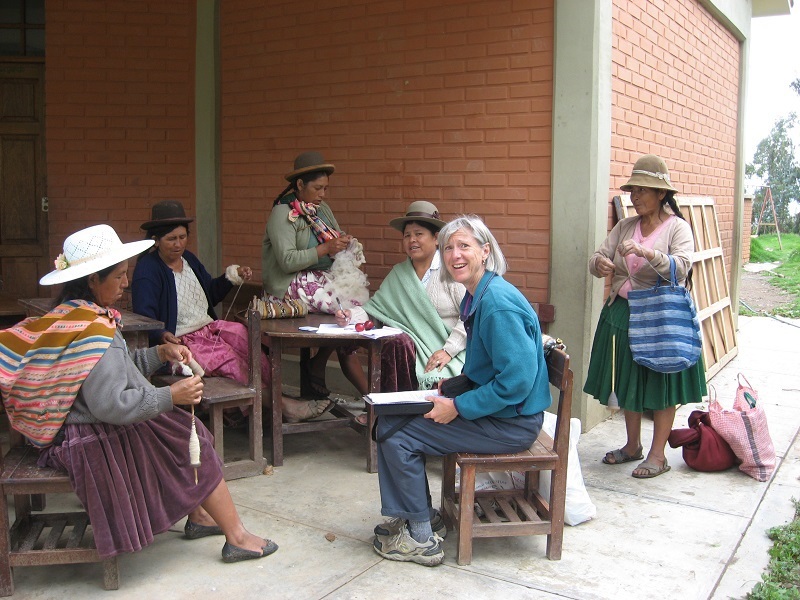 This is a super opportunity for a TNNA member who has an affinity for the Andean textile traditions. 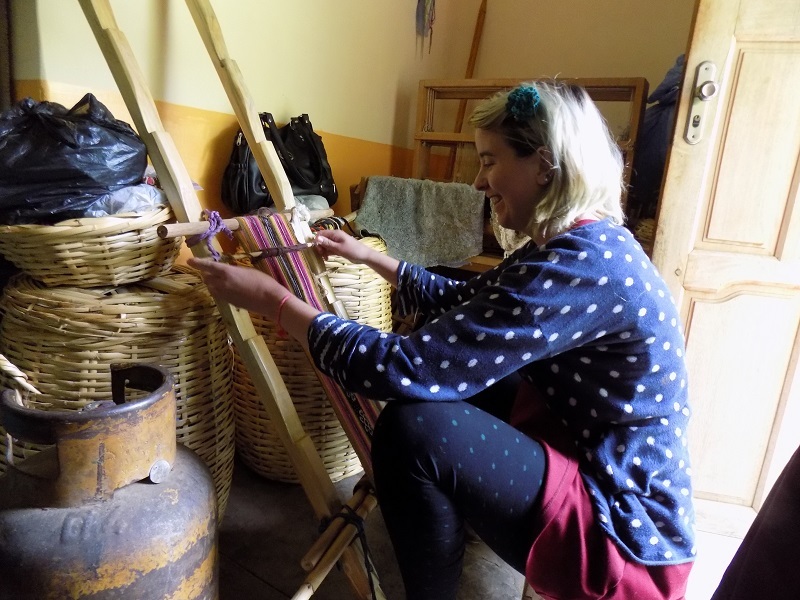 What better way to develop a personal relationship with rural spinners/weavers? Expenses have been met annually thanks to social media help rallying support for the team. Information about the team is archived on the blog during the months of September and October going back to the team’s first competition in 2014. All spinning is done with phuskas (drop spindles) which is a central activity in the fading rural way of life. The Warmis Phuskadoras love competing and socializing during Spinning Week. Annual registration for the Club de Artesanas (CdA) is in February after the women and teens settle back into Independencia following Carnaval. 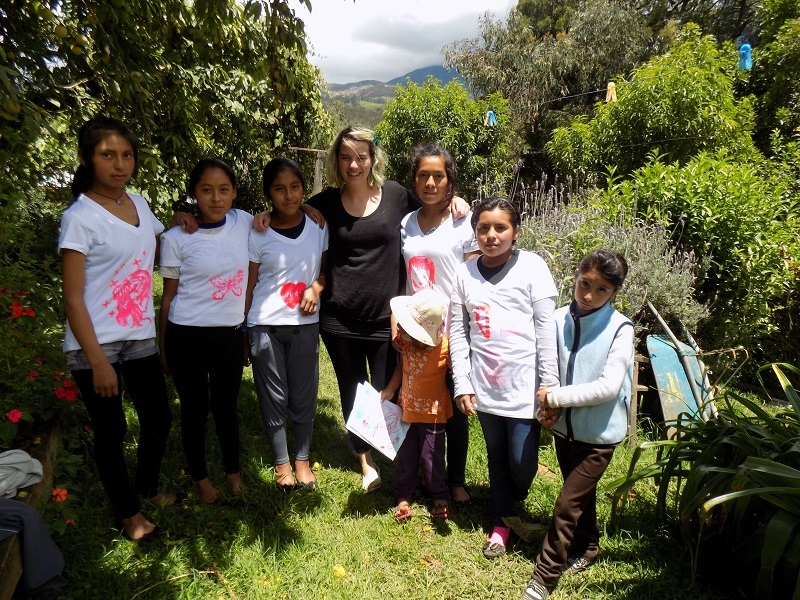 The CdA chicas lost teen trainer Abigail who now lives with a family in the city providing child care part time and attending high school. Jhesica who will turn 16 this year has begun her second year as a teen trainer and was thrilled to receive a wage increase. Each of the 3 teens from last year invited a younger friend to join and many bring young siblings so there is a lot of youthful exuberance on Saturdays. The CdA women will miss Adviana who has been a devoted member since 2012. She and her family migrated to the city during the vacation. She entered the Club as a timid 17 year old mother and through the years she learned to weave and was completing orders regularly to earn income to care for her 3 little ones. It was mainly because of her that the waiting list was added so more spinners could enjoy Spinzilla Spinning Week in 2017. She begged to spin, but not being up to speed with the older women the wait list was implemented to accommodate and encourage her and 2 other young spinners. May her self confidence that grew through the years of CdA activities and with the support and friendship of the other Club women enable her to transition successfully to life in the city. Club attendance was low in February because of women and teens spending much of the month in their rural communities. That allowed Surya, the visiting artist, to work one on one with Club members as well as with groups. Doña Máxima learned to embroider in primary school and on her first embroidered piece working with Surya she learned new stitches but her designs continued to be just outlines. On her second piece she made the leap to use newly learned stitches to fill in her designs and kept then kept stopping to admire and show off the results. Surya taught two of the teens how to use the sewing machine, including using the instruction book as a resource when there is a question or problem. Nelva had finished a beaded embroidery piece under Suyra’s tutelage which she sewed into a bag. Veronica learned to sew by making a small shoulder bag with a button closure and a zippered pencil bag. The teens also learned about perspective in drawing and had fun with water colors. Suyra had brought all the supplies to teach screen printing and worked with the teens for 2 months ending with the final project of a printed t-shirt. 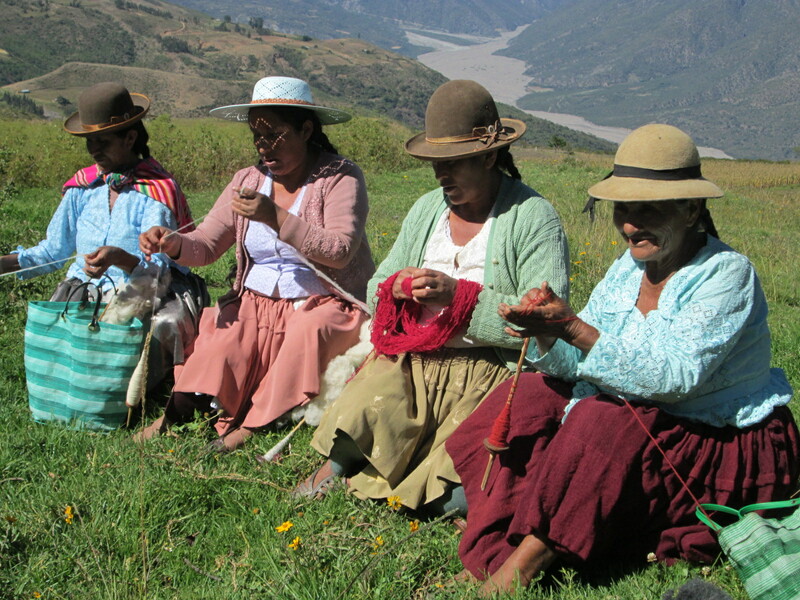 The weavers of Huancarani began dropping off skeins to be dyed as rainy season is dye season. The Club held a dye day to take care of the accumulating skeins from the Huancarani weavers. The dye pot of suyku leaves produced light and dark greens skeins. 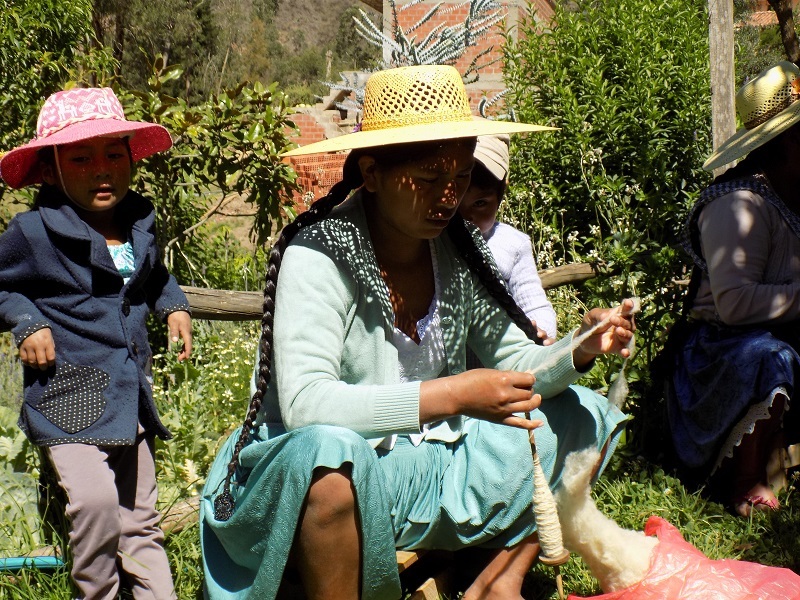 Fresh turmeric root had been purchased from a sidewalk vendor in Cochabamba in October, and although roots were beginning to sprout once mashed up one dye pot of vibrant orange skeins was produced. 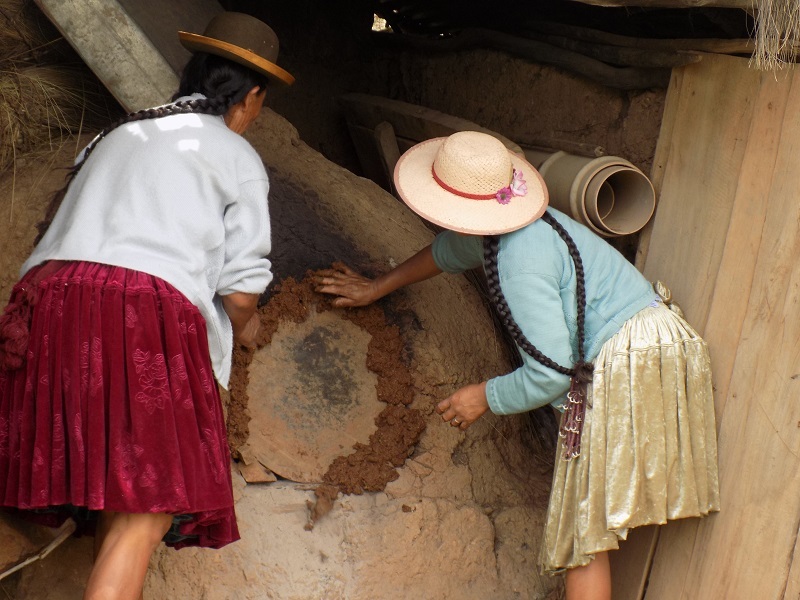 The turmeric pot was mixed into the fifth dye bath of cochineal to dye skeins a rich dark orange. 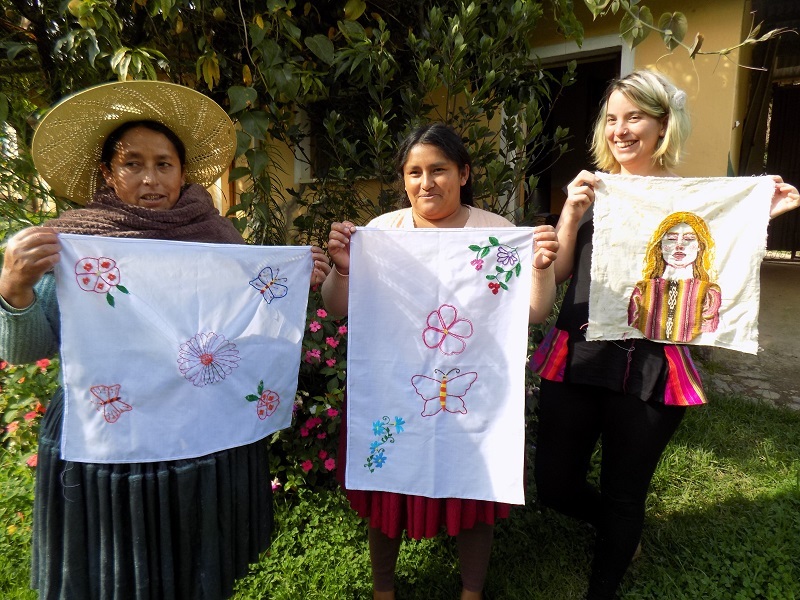 Surya taught a batik workshop to Vilma and Doña Maxima and they experimented on cotton cloth, silk scarves, and cotton t-shirts with varying degrees of success. The leftover dye pot of the turmeric and cochineal was almost exhausted so further experimentation will take place with stronger dye pots on the upcoming dye days. 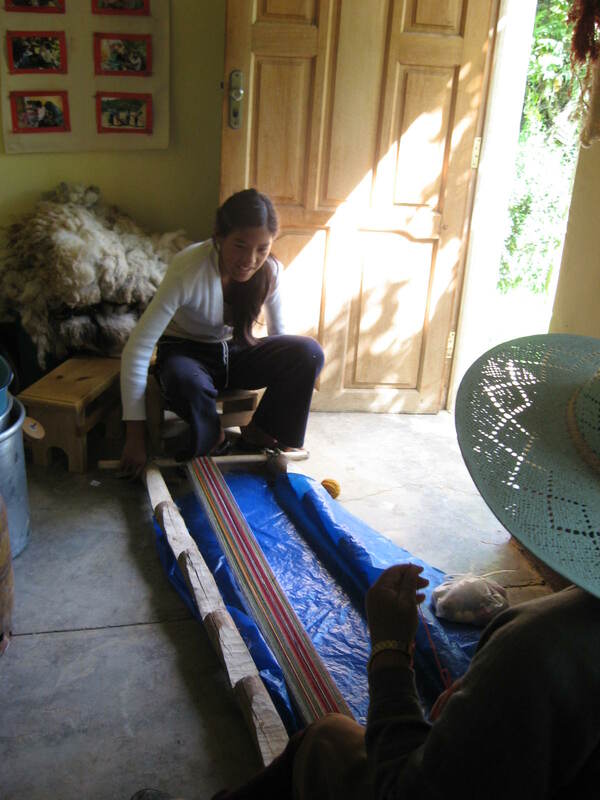 Surya, is the second volunteer in 8 years to take advanced classes from Doña Maxima and complete a weaving on the loom. 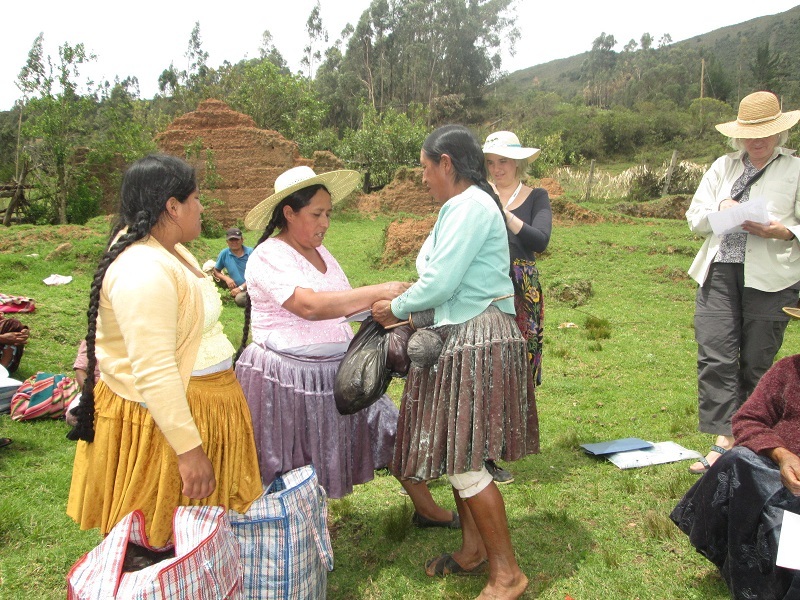 She is the first volunteer to weave the cloth, strap, and border to assemble a ch´upsita (small shoulder bag). 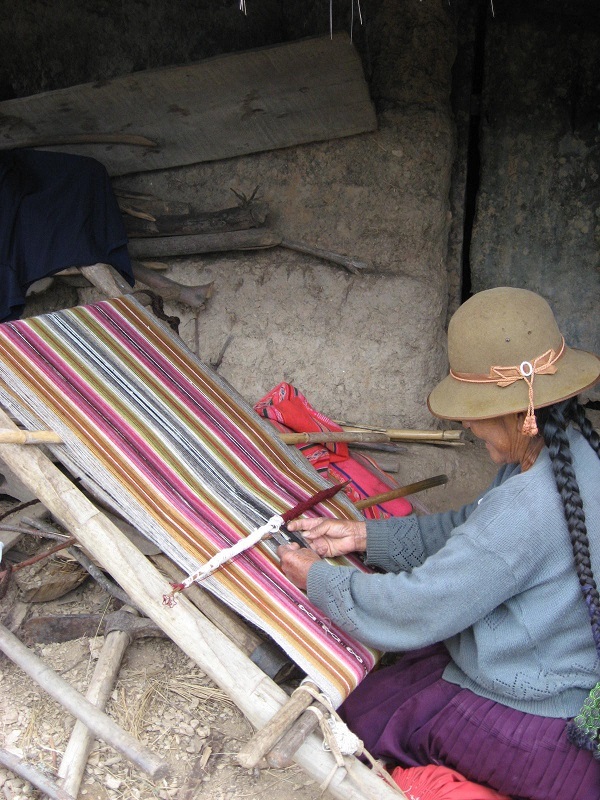 It is surprising there are not more weavers who have visited to take classes with Doña Máxima to learn traditional Andean weaving techniques. 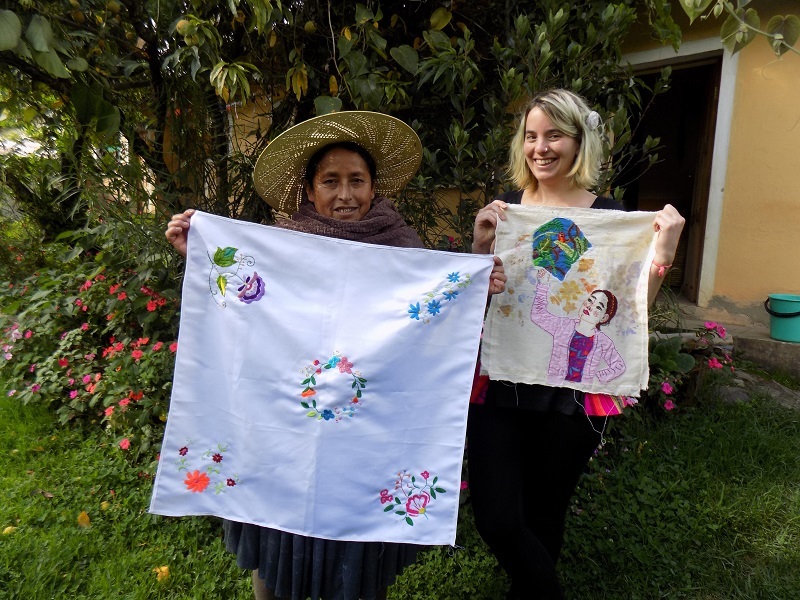 Surya taught embroidery stitches and worked on her own pieces for an exhibition at the Kiosko Galería in Santa Cruz Bolivia beginning on March 15th. She cunningly incorporated an end piece of her weaving and used the thrums as embroidery threads, which was a tug of war with each one because of their rough texture. However, the results were stunning with the natural dyed wool blending together for a natural looking portrait. There was just a week between the beginning of the academic year and returning to vacation mode for the week of Carnaval. 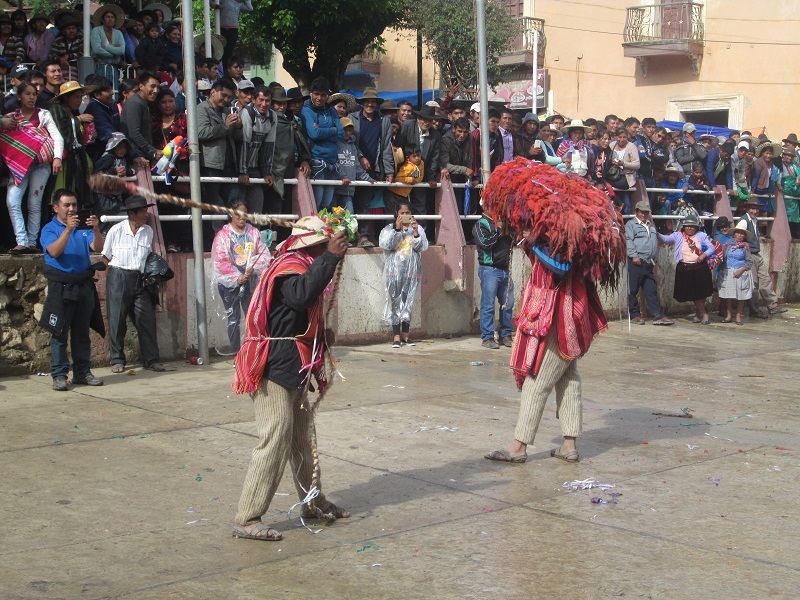 The Independencia Carnaval parade and dance competition is the best time to view traditional weavings. 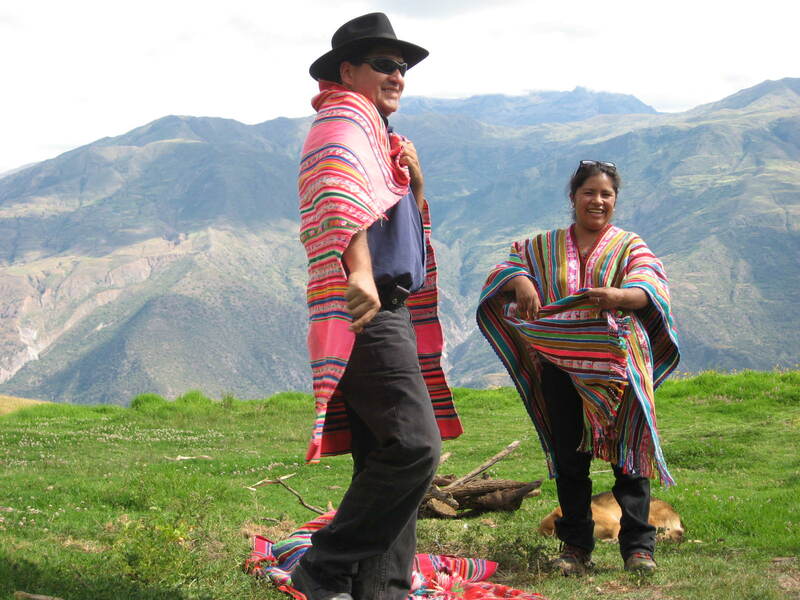 The traditional clothing is loosely woven wool (bayeta cloth) pants for the men and polleras (skirts) for the women. Last July, when asked about what topics to include in the Tinkuy presentation the women of Huancarani began talking about bayeta and their youth that preceded purchased ready to wear clothing. The men constructed the looms and wove the cloth. The women spun cotton for the heddle strings, which was the only time they spun cotton. Finding an example of a loom to take photos has so far proven elusive because of the tradition of burning the possessions of an individual upon their death. The small chuspitas (shoulder bags) served as pockets for the men to carry coca leaf, which most still chew when working in the fields as well as being part of Andean rituals. The chuspitas for celebrations such as Carnaval are always woven with brightly dyed acrylic yarn often with embedded double weave designs on the bag and the strap. A few of the male musicians sported old fajas (belts) of double weave. 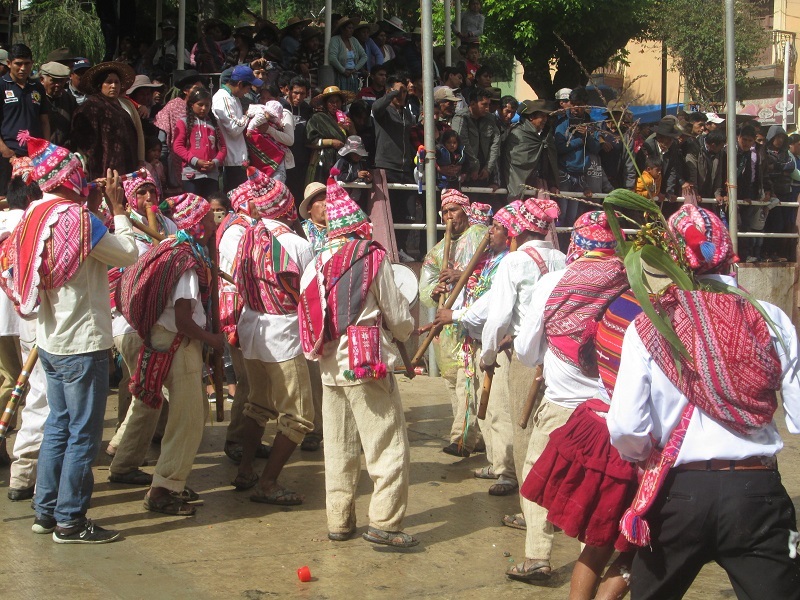 The male musicians and female dancers all wore aguayos (square cloth for carrying loads on one’s back) and the majority of them appeared to be the 2 piece handwoven aguayos as opposed to the one piece inexpensive factory made aguayo. 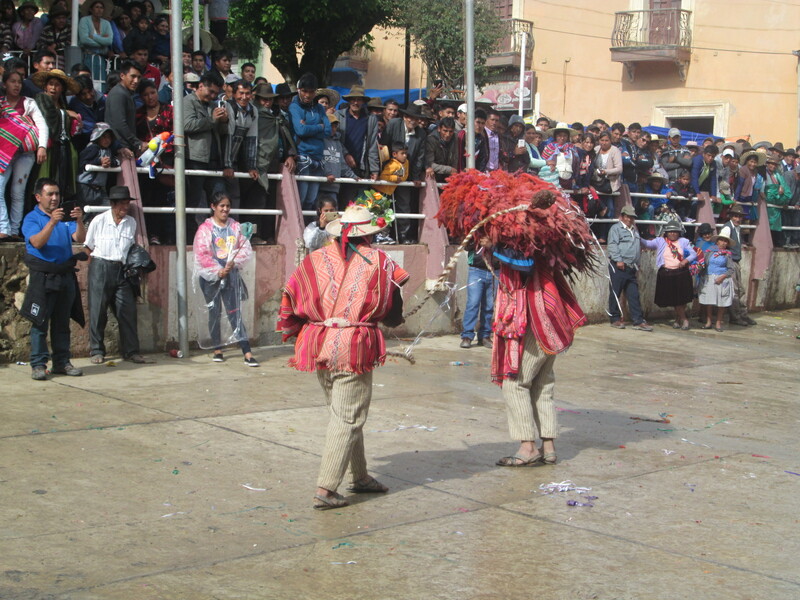 The competing rural communities had around 20 minutes to play the piercingly shrill music and dance in the plaza for the judges, authorities and spectators. smacked into the sheepskins. When the rock slinger missed he took the sheepskins to protect his head so that his friend could demonstrate his skill aiming and striking with the rock ended whip. 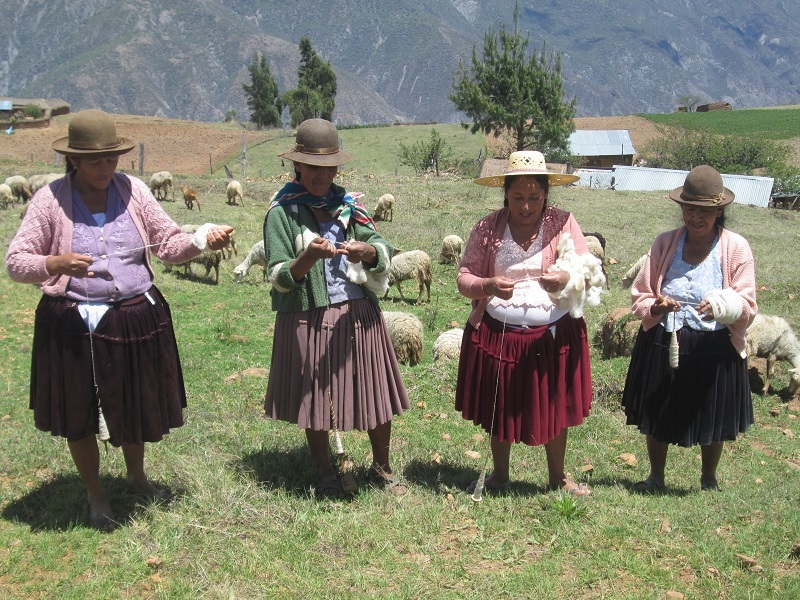 Slings were the preferred weapons of the Incas and today a braided llama fiber sling can usually be spotted in the waistband of a rural woman out pasturing her sheep. 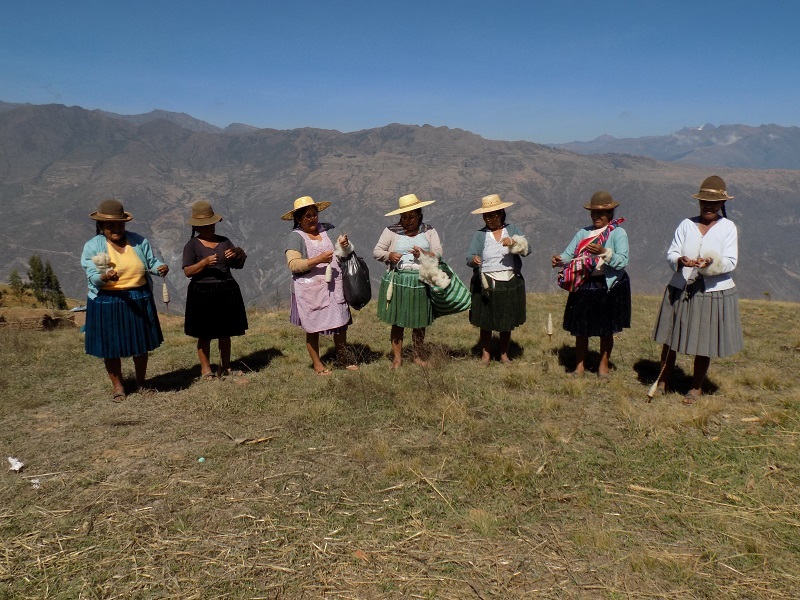 Doña Maxima remembers that when she was a girl in Huancarani slings were one of the trade items that the highland traders would bring when they arrived with their llama trains to trade for corn. 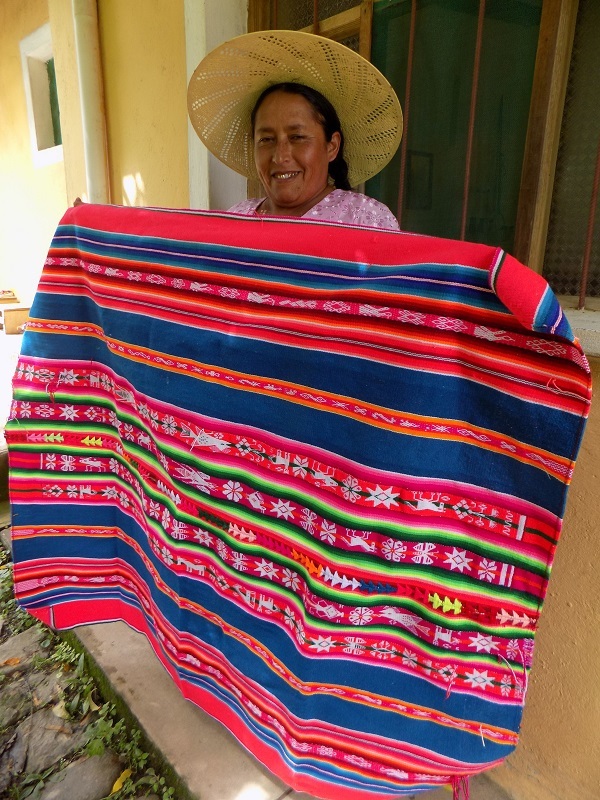 During Carnaval week, Doña Maxima was thrilled to finally finish the aguayo she began 10 months ago in the hope that it would debut at the Tinkuy last November. The weaving was slow going and she lamented more than once that she wished she had begun with just one column of embedded double weave designs in each half instead of two. 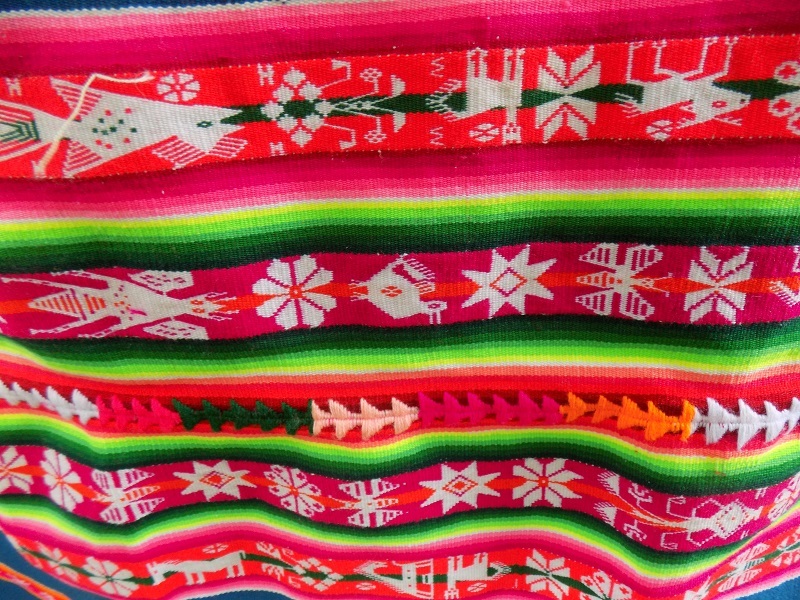 The photo shows the 4 columns of embedded double weave design with the decorative stitch that joins the two woven halves of the aguayo together. She learned the technique from her mother-in-law and sister-in-law when she moved into their house with her husband at age 16. 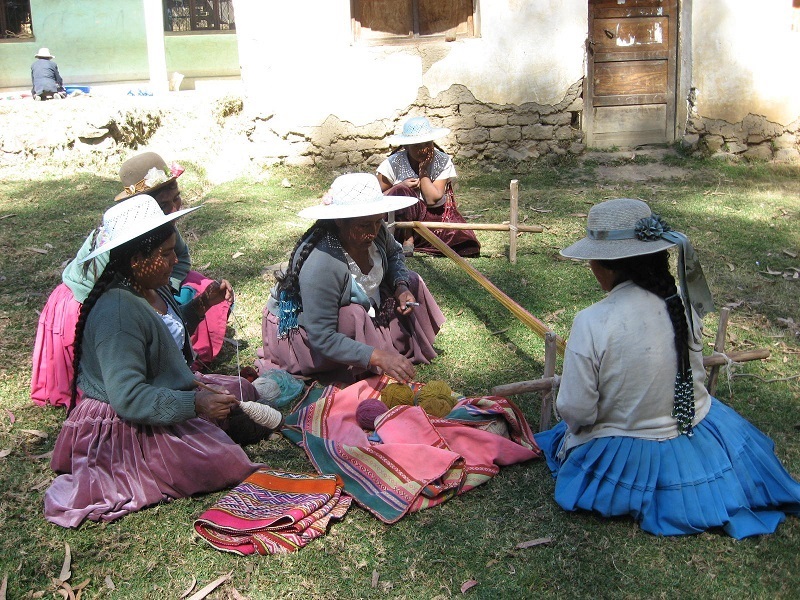 She said they were a family of weavers and she felt obligated to improve her weaving to their level. had a table including Doña Justina who went to the Tinkuy. 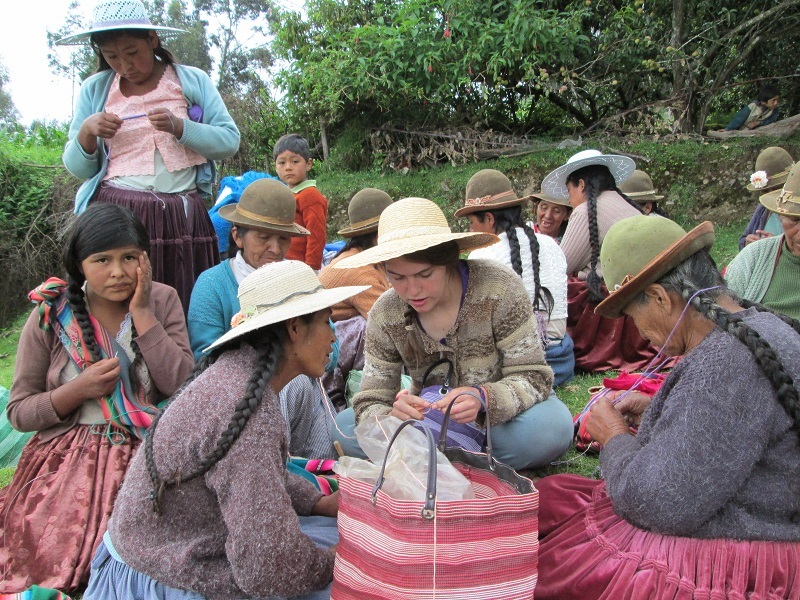 Her sales technique on her home ground was much more animated and she was pleased to have sold a belt and a chulo (Andean knitted cap with ear flaps). One observation was the low number of participants which could be a stark indication of the dwindling number of rural weavers. th’ola shrub were cut and tied to a branch to sweep the oven´s brick bottom clear of ash. Potatoes were tossed inside, the trays were set on top of them, and the oven cover which had been fashioned from the end of a metal 55 gallon drum was sealed shut with mud. 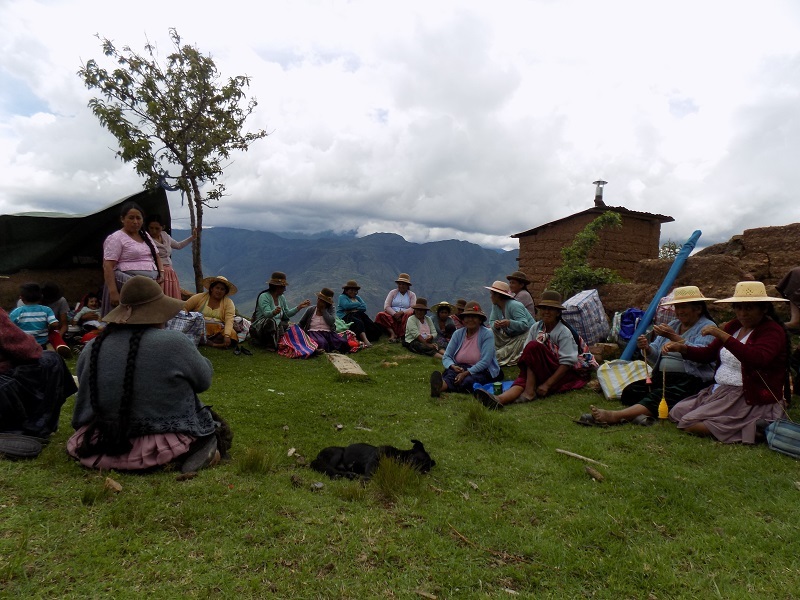 The women settled on the ground for the annual CAH meeting with one eye on the rain falling in the mountains to the south. 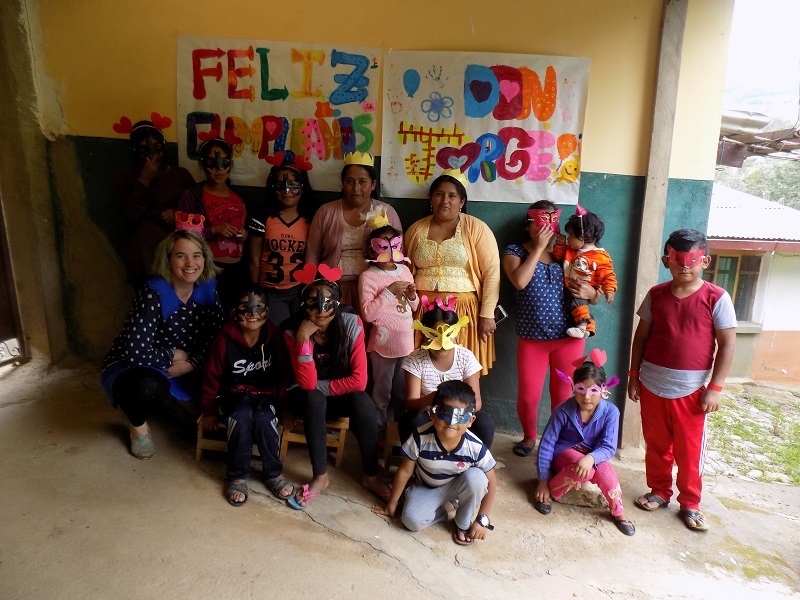 A new Board of Directors was elected, Doña Justina stepped down as President after 4 years of doing an excellent job of coordinating with PAZA for workshops, meetings, and Spinzilla activities. Twenty year old Maribel took over as Secretary, because she can read and write she will set an example for the future of that Board position. Two new members joined CAH and both are younger than the median age of 60 for the members. The weavers voted to establish an “honorable member” category to waive the annual membership fee for elderly women who no longer spin or weave but enjoy the social occasions the CAH offers. 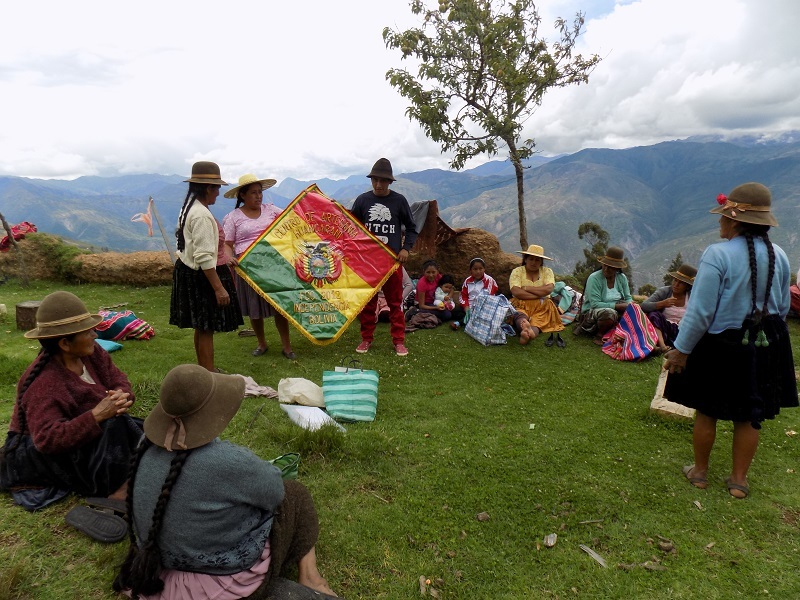 Doña Teodora, who hasn´t woven in decades because of a poorly healed broken shoulder, was CAH´s first honorary member.The new CAH banner was unveiled and all declared it to be beautiful. The intent was to have it made in time to take to the Tinkuy, but the 2 piece pole was so long that it was impractical for travel. 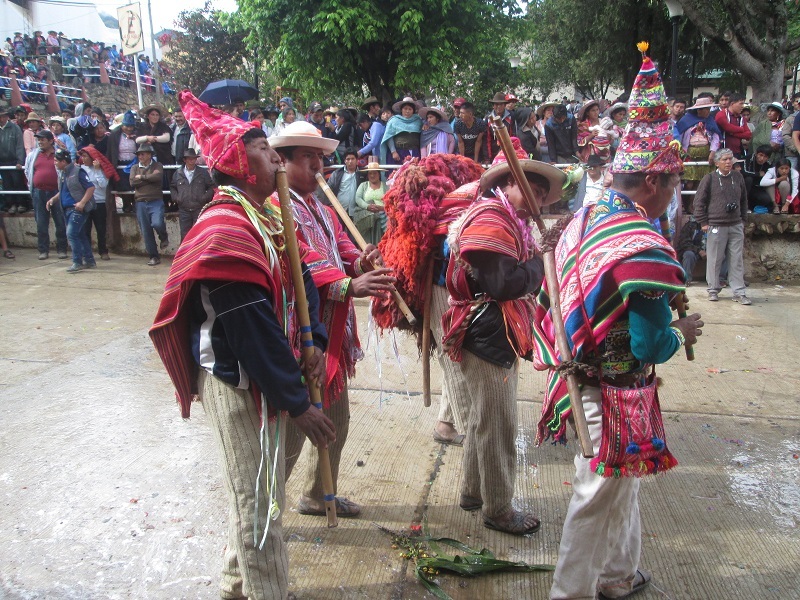 It will be marched around the soccer field in Huancarani in the civic day parades. The vote was unanimous to continue competing in Spinzilla Spinning Week. They asked, “Why wouldn´t we? We spin almost every day anyway and we like winning a prize”. They voted to raise their registration fee 5 Bs. from $1.44 to $2.16 per participant. Time was spent discussing whether or not to raise the price of the weavings and a vote for a small increase was passed. Thanks to Laverne Waddington the fajas (4-1/2” x 71” bands) are gaining popularity with U.S. weavers who purchase them to design and cut up for their own projects. The 2018 price was raised from $35 to $38. The price for a kilo of handspun yarn went from $10 to $11.50. Doña Máxima and Doña Justina spoke about their Tinkuy experiences and photos were passed around. 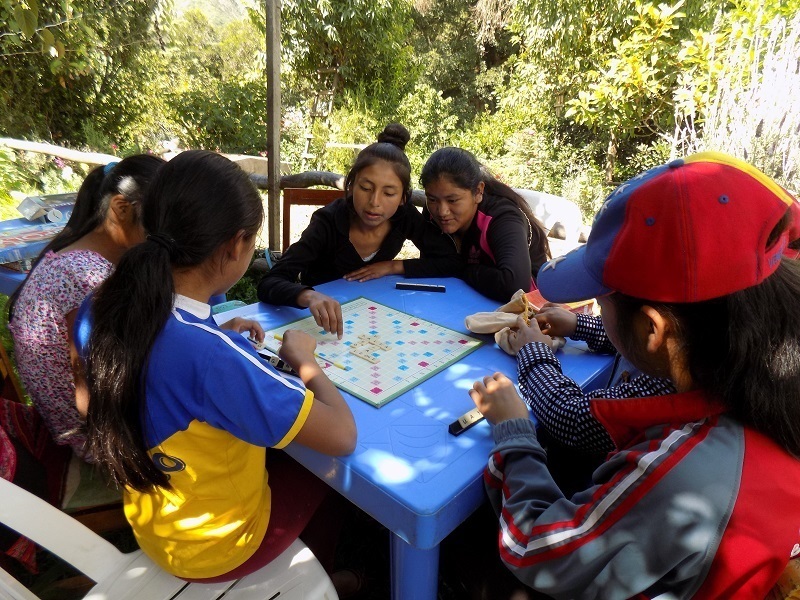 The women were able to put a face with the name they hear many times during Spinzilla and that person is Marilyn Murphy of Cloth Roads who has sponsored the Bolivian team for 4 years. 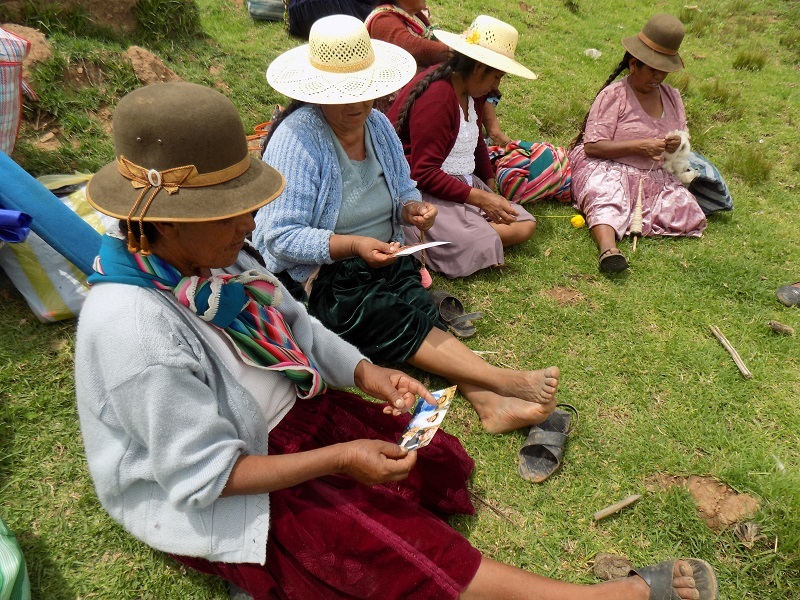 There were also photos of Doña Máxima and Doña Justina presenting thank you weavings to longtime supporters Lyn Lucas and Dorothy Thursby. The photo of Karen Sprenger at the exhibition table with Doña Justina and Doña Maxima was appropriate because she´s been instrumental in helping with sales of the inventory stored in Kansas. The meeting adjourned and the moment all had been waiting for arrived with the handing out of the shawls, the 2017 Spinzilla prize for all participants. 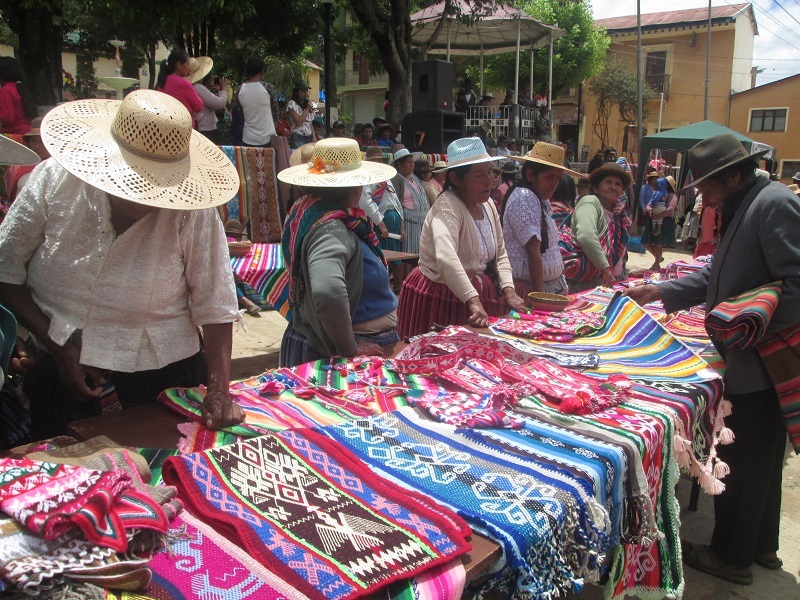 Doña Máxima and her daughter Zoraida had selected and purchased the cloth in Cochabamba. The material was divided between Zoraida and the CdA members so they could earn a wage by crocheting the borders and adding fringe, thus personalizing each shawl. Unfortunately, a group photo was not taken because the wind picked up and the clouds had darkened. 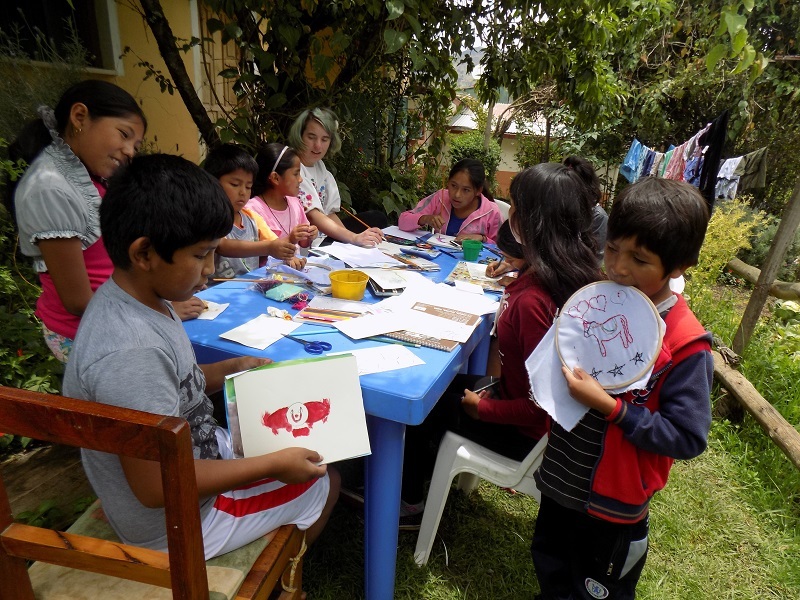 Embroidering, making piñatas, drawing, water coloring, and the Fiesta de Don Jorge made for a busy January for the Club de Artesanas (CdA). 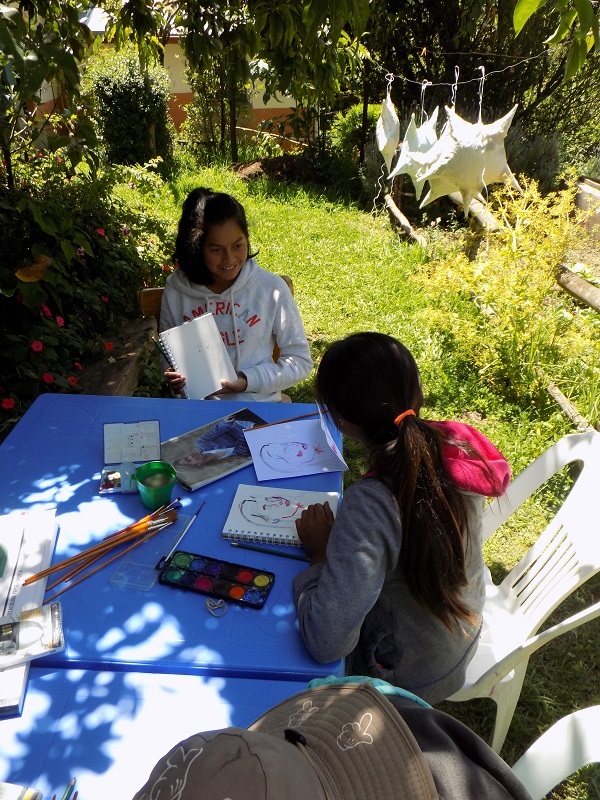 Under the tutelage of artist-in-residence, Suyra de Wit, the CdA women, teens, and kids were all thrilled to spend the 2nd month of the school vacation busily occupied with art projects. The first project Surya introduced was embroidering a design of choice. The embroidery of flowers as a required project at the local primary school has been replaced by fabric painting. 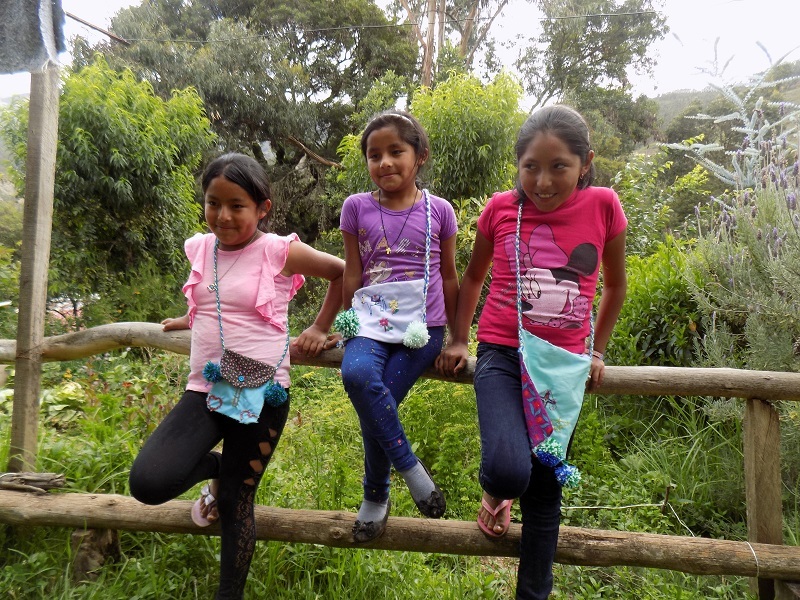 The 3 girls completed their embroidery and with help from Suyra made small shoulder bags to showcase their work. The teens chose to use beads from the jewelry making kit to embroider their designs. The intent focus of the 2 boys over their embroidery hoops was a surprise. Doña Maxima commented that she liked the textural possibilities by combining known embroidery stitches with the new stitches she learned from Surya. Preparation for the Fiesta de Don Jorge began a week prior to the annual all day party. 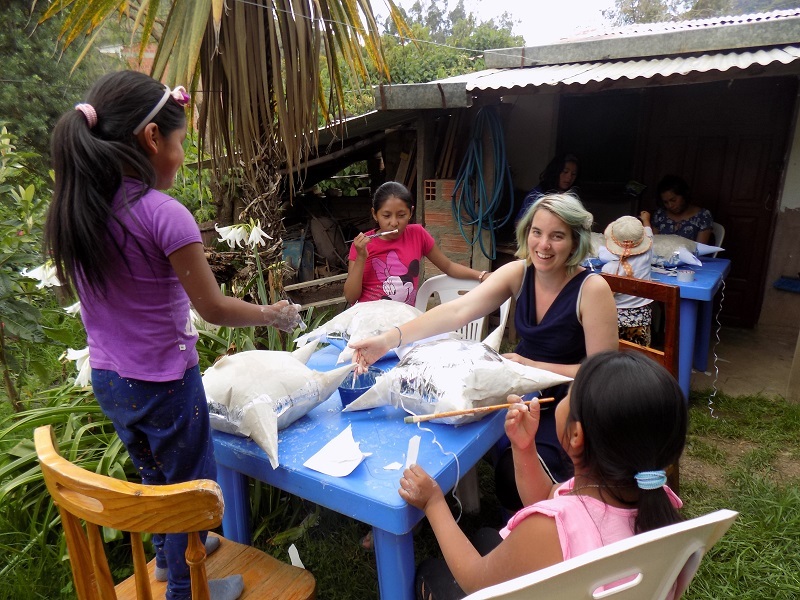 Three Club families had birthdays during the month so a total of 4 piñatas were made. The layering of the paper mache over the balloons went quickly because it was the 2nd year of piñata making. Thanks to Surya’s help, the fringe decor was an improvement over last year. PAZA provided for the piñata filling which included toothbrushes and pencils along with the sweet and salted treats. On the day of the Fiesta the library and workshop overflowed with everybody working on masks and crowns. Lunch was everybody´s favorite festive dish, “Pique Macho”. Piping hot French Fries are piled with bite-size chunks of meat and sausage in a savory sauce. The diner adorns his or her heaping plate of yumminess with hard-boiled egg, onion, tomato, chilies, and in the kids case a lot of ketchup, mustard, and mayonnaise. Doña Máxima and Vilma peeled and cut up 13 pounds of potatoes with knives – peelers and cutting boards are not local culinary techniques. 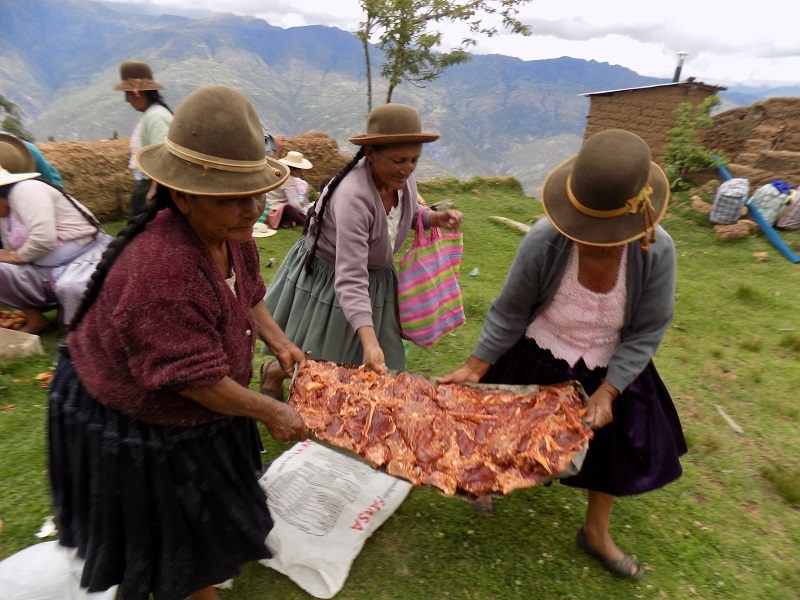 Doña Máxima headed to the outdoor cooking lean-to to start a fire for frying the potatoes and Vilma headed indoors to cook the meat on the gas range. There was a bit of a lull after the meal. Everyone rallied for games and worked up an appetite so they could enjoy the 3 layer chocolate and lime birthday cake. Don Jorge will turn 88 in February and hopefully the photos and best wishes will reach his Kansas mailbox this year. Saturday mornings were reserved for the teens to work on their drawing skills. Surya is a portrait artist and noted that they had not learned to sketch a big picture but focused on small details. 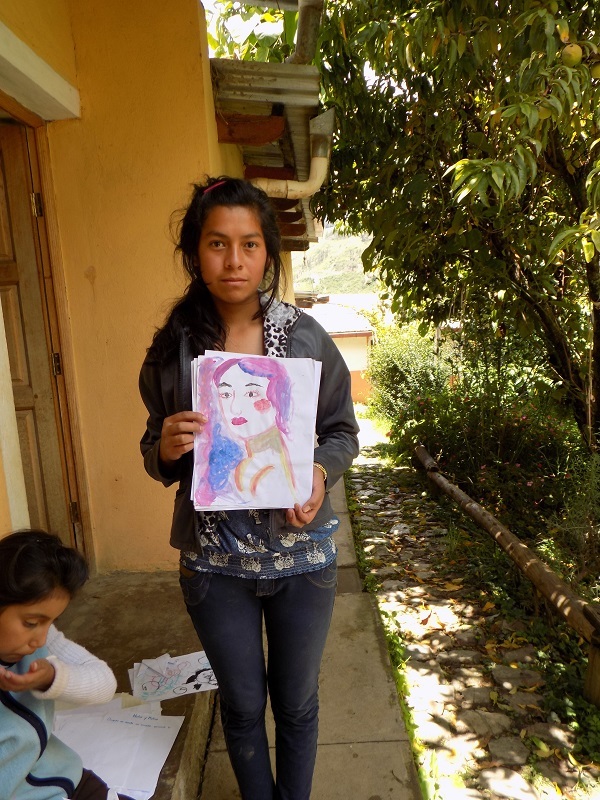 She started the classes with timed drawings of self-portraits, followed by instruction, and ended the class by letting the teens watercolor for their enjoyment. Surya’s work may be viewed at www.suryadewit.net. On Sunday the 14th an emergency meeting of the Centro de Artesanía, Huancarani (CAH) was called at the PAZA workshop. A new President needed to be elected to replace Doña Cirila who did not meet the requirement of being a member for 2 years. She took it upon herself to go in search of the CAH members in town for market day and managed to gather up a quorum of 14. Her mother, a founding member, won the election and hesitantly took on the responsibility after Doña Cirila promised to help her. Maribel, Secretary and the youngest CAH member, ran the meeting as the most senior Board member. It is heartening to observe younger members taking an active role in the organization. The school year begins on February 5th, and that means high stress for mothers to come up with the cash to purchase school supplies. 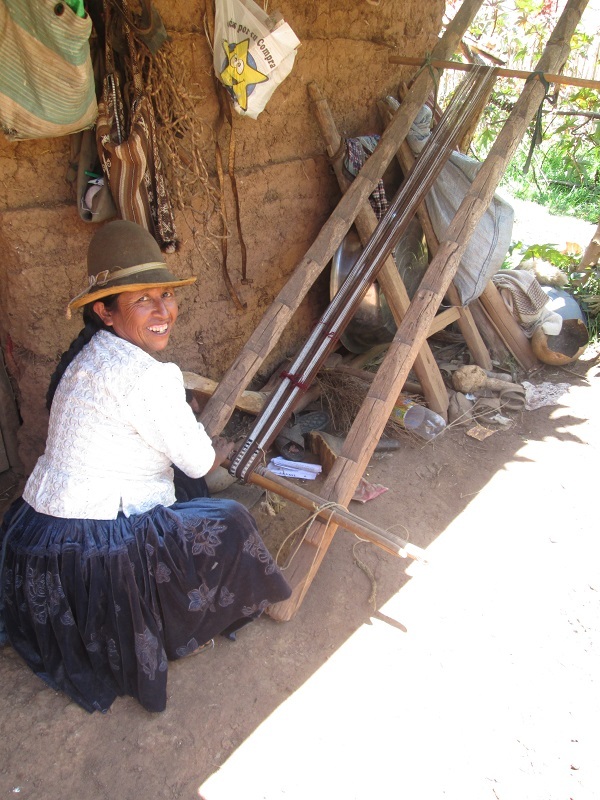 PAZA always has a weaving order so the weavers can count on income in February. During the last 3 Sundays in January most of the active weavers stopped by the PAZA workshop inquiring or dropping off an order. 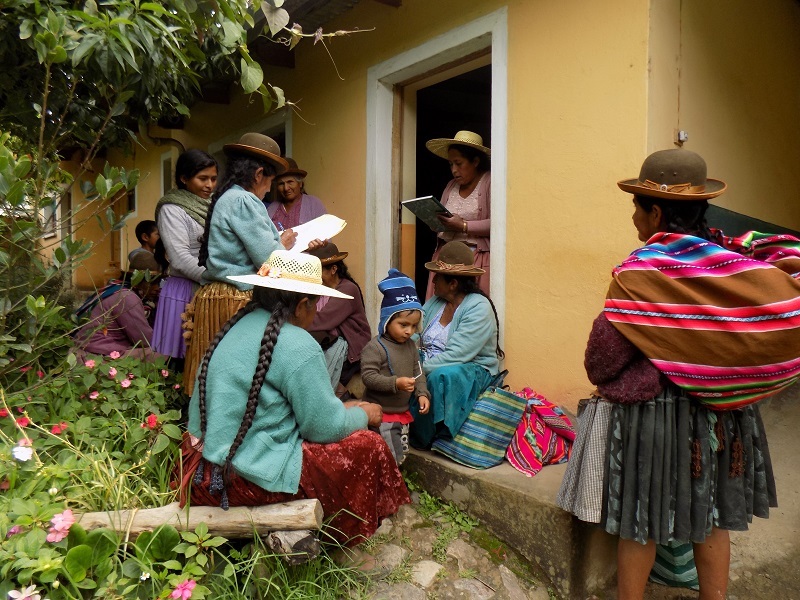 Doña Eulalia sighed as she commented on the ever increasing list of school supplies as her 4 children move through primary into secondary school. The weavings will be in the U.S. the end of April and need to be sold to keep the PAZA rotating fund for the weaving orders rotating. Thanks to the use of the weavings in Laverne’s Waddington’s workshops PAZA sales have changed from a myriad of products of our design to selling the cloth for you to design and cut for your own creations. The fajas (traditionally belts) are 70”x4.5”, wider weavings that we use to make the zippered pouches are 63”x9.5”, and straps (size used for the yoga mat straps) are 74”x1.5” or a bit longer at 78”x1.5”. There will also be zippered pouches, yoga mat straps, and a few ch’uspas (shoulder bags). Inquires can be sent to dkdutcher@hotmail.com.